Cortez Web Services designed a custom website for Southwest Seed, using their branding to professionalize their online presence and update their look, yet retain the family-owned small company feel. The new website provided a great opportunity to freshen up their content as well as their look, but the most noteworthy feature of the website redesign was the addition of an online product catalog. 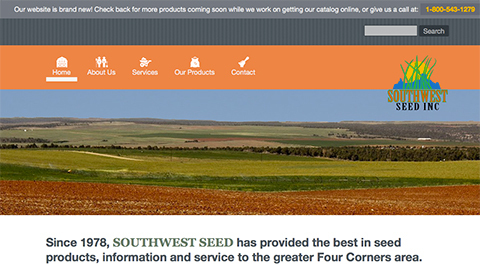 Southwest Seed’s new website includes a working catalog of their many specialty items. A customized cataloging system built to their unique specs allows Southwest Seed to update their product catalog with specific information about each product so their customers can learn about Southwest Seed’s offerings and their practical uses.